Historically, it was easy to tell when you were entering or leaving a city. Its borders were indicated by walls and gates for centuries and in more recent times by generous greenbelts that separated one city from another. Between Belmont Park and the Laurelton neighborhood in eastern Queens, the Cross Island Parkway straddles the city line, separating the city from the suburbs of Nassau County. At a point just south of Linden Boulevard, the parkway has a tight hairpin interchange with Southern State Parkway, and a hidden stream flows beneath the twisting “suicide” curve. As often happened, when planners were charting paths for future highways, the easiest routes to map were along existing streams, where property acquisition was much easier to achieve. This week’s photo is from an aerial survey conducted on August 8, 1951. The photo comes from the New York State Archives. On November 7, 2014, the New York City Council passed legislation to reduce the speed limit on city streets to 25 miles per hour. Generally, drivers are adhering to the new law, but on a quarter-mile stretch of Jewel Avenue between Van Wyck Expressway and Grand Central Parkway, the road widens as it travels through parkland and drivers push the pedal as they travel atop the isthmus separating Willow Lake from Meadow Lake. The Photo of the Week below comes from the New York Public Library collection, a series of aerial surveys taken between 1937 and 1939 that recorded the construction of the city’s largest freshwater lake. As New York City developed, often, it was the parks that preserved many of the ponds from being buried in favor of apartments and offices. The relationship was mutual as the ponds were often selected as park sites and in turn the parks preserved the ponds. Sometimes where there were no ponds, the city would carve bodies of water inside parks to serve a variety of recreational functions such as fishing, model boating, ice skating, or simply to evoke a pastoral pre-urban scene. Earlier this week, the New York Public Library released to the public nearly 187,000 free images. 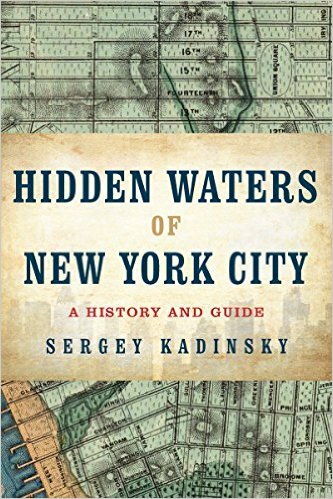 Searching in the database for materials on New York City’s hidden waterways, there is plenty to see and it will take time for me to select images that are worth sharing on my topic. In the meantime, I’ve looked at other government agency collections for photos on the city’s streams and came across this gem from the Library of Congress.